Hey folks, my son is looking for a mini table saw, with 4” or 5 1/2” blade, that can cut up to 3/4” hardwood. He would like to keep the price at $150 or lower if possible. Any suggestions? Most everything we’ve found so far is doing good to cut 1/4” balsa. Not the best tablesaw in the world, but it meets your budget and will cut much more than just 3/4”. 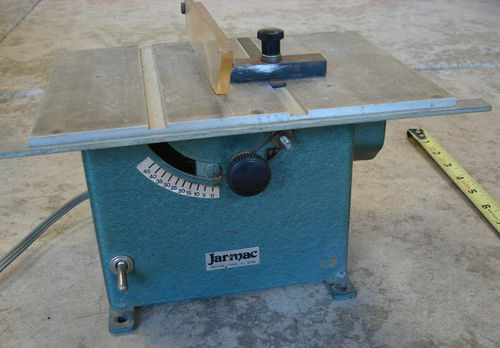 A smaller “tablesaw” would need to be handmade and use a circular saw bolted underneath a plywood top. IMO, the Ryobi would be eaiser, cheaper, and safer. For something that small I think your best bet’s going to be making your own out of a circular saw. Or you could go with something like this: https://www.amazon.com/Rockwell-BladeRunner-Portable-Tabletop-Accessories/dp/B00L47FZ8A/ref=sr_1_2?ie=UTF8&qid=1514587544&sr=8-2&keywords=rockwell+bladerunner+x2+portable+tabletop+saw. it’s extremely compact pretty versatile for all sorts of things. We looked at the blade-runner, but question it making straight cuts like a table saw, which would be its primary function. A 10” saw is too big for cutting the narrow strips he uses. Looked at one on Amazon but when we saw “made in China” with a 6+ week delivery decided to pass. I have a 5.5” handheld circular saw that we may consider clamping to the bottom of a table. That would give him height adjustment as well as tilt. How narrow are the strips? Convert a tile saw using a wood blade, instead of the tile blade? If a jobsite table saw is too big, then I would look into a benchtop bandsaw. Craftsman’s 10” bandsaw is a pretty good saw and you can usually find one on CL’s for about $100 – $125 in your local area. That said, I have a Jet contractors saw, and I can cut 1/32” strips with it. It’s all in how you set it up. market. Smaller blades can be installed. I prefer to rip thin sections on the band saw. without too much trouble using a hand plane. G’Day Dan, Not sure if you can still pickup a secondhand Hegner MK4 multifunction. The blade is 6” and that’s the only part of the machine I really use…TOP MACHINE. 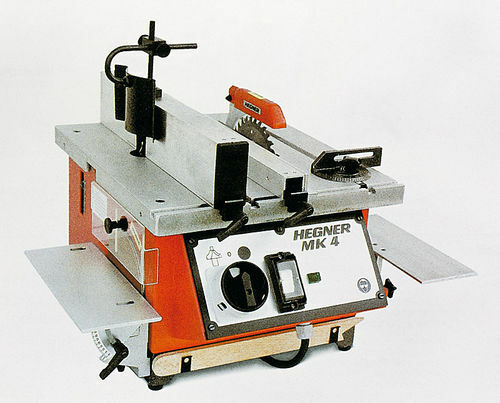 I use mine for all my toymaking on Aussie Hardwoods…. One of these might do the Job. Whatever saw you end up with, a “ripping sled” makes thin strips much quicker, safer, and more precise. Note this is not a jig (though originally I called it that), nor is it a cross cut sled. You should be able to find it with the LJ search feature. So what is the issue with the 10” table saw? You can put a smaller blade on the saw (I’ve used 7 1/4” blades on my 12” saw with no problem as long as the arbor hole is the same. A zero clearance insert would keep narrow rips from getting trapped. Contractor saw. A sled with t track and hold downs? So what is the issue with the 10” table saw? My son has a small workbench set up in a spare room in the house. Have a 10” contractors saw with various sleds for bigger stuff. Here is the 4” table saw I have had for many years. It does a wonderful job for model making! Will cut pine and other hardwoods accurately and easily. 3”/4” hardwood might be a little much though. It will cut close to 3”/4” though. I/2” is more like it at max. You can occasionally cut thick wood by making a rip slightly more than half way through and then turning the wood over and making a 2nd cut. No longer made to my knowledge. You can probably find one on eBay with some patience. Be sure to get the one like this! They still make a smaller one that would not work well for you. And yes, it should come with a fence (not shown in the photo). The real secret to these little saws is finding a 4” blade that is a carbide tipped blade. I have one I bought a few years back carried by Harbor Freight that is a 4” blade that makes a 1/16” kerf. They no longer carry it. The carbide blade avoids the saw blade binding in the cut like the often used metal slitting saw blades do. These slitting saw blades have no set to the teeth so the blade rubs the work at high speed creating heat that expands and warps the blade making it bind in the cut.